A “bohemia” with its cafes, where debates take place about theater, cinema, litrature and philosophy. This is Cihangir. There is a reality about Cihangir which we just have to mention. Cats! Cihangir is like a heaven for them. In all colors and all ages, they are everywhere in Cihangir. They sleep anywhere they like, and as you know, there is no other creature on earth that sleeps that much. To be honest, you feel like becoming a cat, as you see so many cats sleeping on a cornerstone on the stairs, underneath the trees, sleeping carelessly. Especially when we were just about to take a picture of a cat, an old lady came out of nowhere, giving the cat a handful of dry feed, by saying “Mama has come, mama has come.” You climb these stairs slowly. The long stairs of Cihangir are one of the most famous features of Cihangir. You run into them just about at every corner. It is as though Ahmet Haşim wrote his famous “Stairs” poem about these stairs. With its beautiful view, the stairs of Cihangir remind you of another poet, Orhan Veli. He once said; “Towards Gemlik, you will see the sea. Don’t be surprised.” You shouldn’t also be surprised when you see the beautiful view of the Bosphours, Üsküdar, the Maiden’s Tower, when you climb the stairs. On the other hand, it is a “bohemian” zone where the painters, caricaturists, actors, writers, journalists, foreigners and minorities live. A “Bohemia”, where cinema, theater, literature, philosophy are discussed at countless corners, banquettes, alleys, cafes along the road and bistros. In late 19th century, Levantines used to live here, just like in Pera. 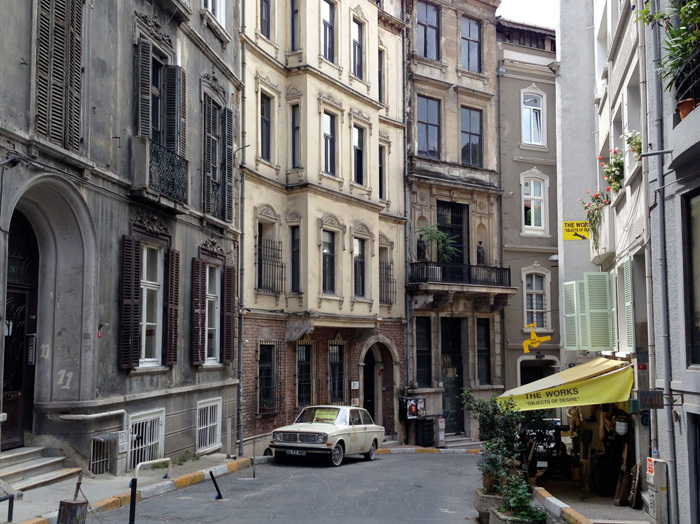 In the 1920s and 1930s, Cihangir only consisted of two districts. In the 1940s and 50s, the people that were working at entertainment spots in Beyoğlu began to live in Cihangir. This led to the construction of luxurious buildings and the district became a settlement for well-endowed people. After the second half of the 90s, with the support of the public bodies and the efforts of the non-governmental organizations, the district gained its recent identity. The derelict houses of the district were reconstructed. When this chain of events merged with the beautiful scenery of the district, the rents began to rise and this had changed the identity of the residents. With the changing of the residents, Cihangir evolved slowly into a city apart from the city, a subculture which creates its own culture.One side of it maintained its small, cozy spirit, and the other side combined the bohemian aura brought by its residents and the traditional spirit of the district. This was so successfully done that neither the spirit of the district was damaged, nor the bohemian aura lost its taste. As in the Tünel district, people complain about these developments; about popularization of the district, rising rents, the traditional fabric being damaged; however, we should note that most of them are happy about this. It is not easy to find such “special” places that create their own culture. So, the best thing to do is to enjoy Cihangir, isn’t it? There are many cafes to go for chat, while you have a drink and eat and relax. The most popular of them are Susam, Kahvedan, Meyra (former Leyla), and Smyrna. For fish, you can drop in at Doğa Balık, and to embrace the sea you may go down to the shore through the stairs to Fındıklı. The lexical meaning of the word “Cihangir” is “The person that captured the major part of the world”; however, it is weird that such an ambitious word is the name of this mild district. To find out the fact, we need to go back to the past, to Suleyman the Magnificent. Suleyman the Magnificent had a son from Hürrem Sultan, named Cihangir. For the memory of his son, who died young, Suleyman had a mosque constructed in this place that looked like a large rock protruding from the sea. The mosque that was constructed by Mimar Sinan between the years 1559 – 1560 and was named Şehzade Cihangir Mosque. This is how the district began to be called Cihangir.